Amanda Palmer, of The Dresden Dolls fame, performs for fans and supporters of the protest today. Enticed by the growing energy surrounding the Occupy Boston protests, some Harvard students are starting to join in. 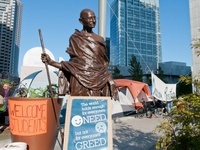 Occupy Boston, a protest movement that began Saturday, is primarily posted in Dewey Square across the street from South Station in Boston, where a tent city has emerged for protesters to stay overnight. Hundreds of protesters have been camped out in Dewey Square—in the heart of Boston’s financial district—attempting to send a message to large corporations and political leaders regarding their disdain for the current state of politics and the economy. Initially, many skeptics said the protesters lacked a clear message, leadership, or goals. Sandra Y. L. Korn ’14, described her own feelings about the movement when it first emerged last week as cautious. 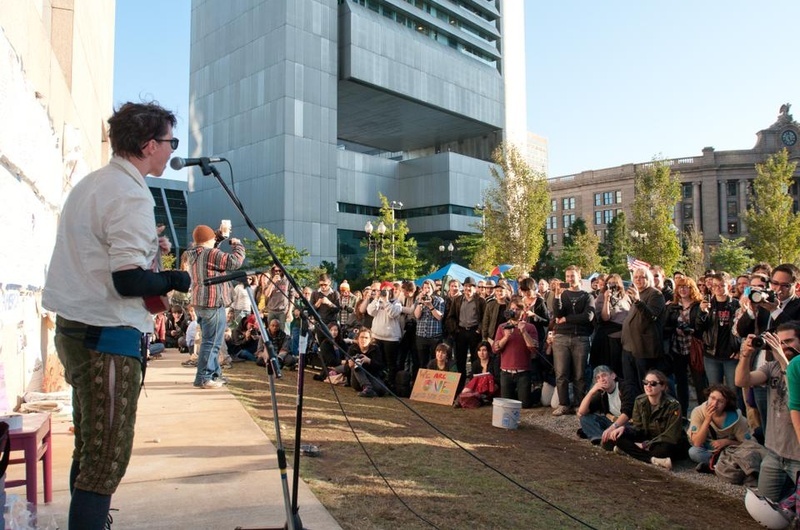 “I don’t know if I would have felt comfortable coming to Occupy Boston,” Korn said. But students who were once uncomfortable supporting the movement are now showing interest, partially as a result of the recent legitimacy afforded to Occupy Boston by large-scale union support. On Wednesday the Service Employees International Union, with more than 150 local unions and over 2.1 million affiliated employees, endorsed the protests. “Now I feel it’s really important, and the movement has gained a lot of motion and legitimacy,” said Korn, a Crimson editorial board member. Student support for Occupy Boston has gradually increased since the occupation first began last Saturday. A group of more than 20 Harvard students joined the protest Thursday. Students from Northeastern University and Emerson College, among others, have become active members of the movement. Although the Occupy Boston campaign does not currently have clear leadership, protesters for the most part say they are rallying around common anger towards corporate greed, growing economic inequalities, and the influence of special interests in politics. At an Occupy Boston general assembly meeting in Dewey Square—organized by overnight demonstrators to deliberate on the intended message of the manifestation—participants spoke at length about allowing corporations such electoral finance liberties. “Corporations are not people,” shouted one onlooker. Last year, the Supreme Court passed the controversial Citizens United decision, which said that corporations should be treated like citizens under campaign finance laws. The 5-4 decision has drawn heavy criticism from the left. The campaign, despite its seeming lack of centralized leadership, is moving to expand its influence through social media—creating a live blog to spread word about the protest and reaching out to college groups through email and twitter. Occupy Boston drew inspiration from the Occupy Wall Street protests that began in New York City in mid-September. So far, the protests in Boston have been less boisterous than the Occupy Wall Street protests in New York City, where on a single day over 700 protesters were arrested on the Brooklyn Bridge. —Staff writer Jose A. DelReal can be reached at jdelreal@college.harvard.edu.